Merck’s aggressive agenda to increase HPV vaccine uptake rates, despite causing thousands of severe injuries, is hitting a stumbling block in a court case alleging blatant corruption. There has been documented evidence that the HPV vaccine has caused more injuries than any other vaccination in history. Despite this evidence however, the HPV vaccination has continued to be hailed a success by the pharmaceutical industry and governments alike. According to the World Health Organisation’s (WHO) VigiAccess database, as of April 09, 2018, a total of 85,329 reports of adverse reactions have been filed regarding the HPV vaccination. These reports include 37,699 reports of nervous system disorders; 2450 cardiac disorders, (including 38 cardiac arrests) 533 reports of Postural orthostatic tachycardia syndrome (POTS); over 3200 reports of seizures or epilepsy, 8453 syncope, and 389 deaths. In July 2016, a case was filed in the Superior Court of the State of California, Los Angeles County (central district). The case involved a 16-year-old female who between 2010 and 2011 received three injections of Gardasil, the HPV vaccination manufactured by Merck. Shortly after she received her third vaccination, she suffered a severe adverse reaction, the nature and complexity of which, failed to be diagnosed until 2015, when she finally received the diagnosis of Postural Orthostatic Tachycardia Syndrome (POTS). For those of you who are unaware, Postural Orthostatic Tachycardia Syndrome (POTS) is an abnormal response of your body when you are upright (usually when standing). It is caused by a problem with the nervous system which controls the autonomic functions in the body. This part of the nervous system is called the autonomic nervous system. If this diagnosis was not devastating enough for this young lady and her family, in 2016, she was further diagnosed with an underlying small fiber neuropathy, existing within and throughout her body. Her family firmly now believe that the vaccinations caused her illness because prior to receiving the HPV vaccination, she was physically active, and had not only participated in her high school basketball team but had also engaged in other athletic activities. As you can see these charges are extremely serious and if won, this case would set a precedent for similar cases to be brought against the manufacturer of this vaccine in the future. 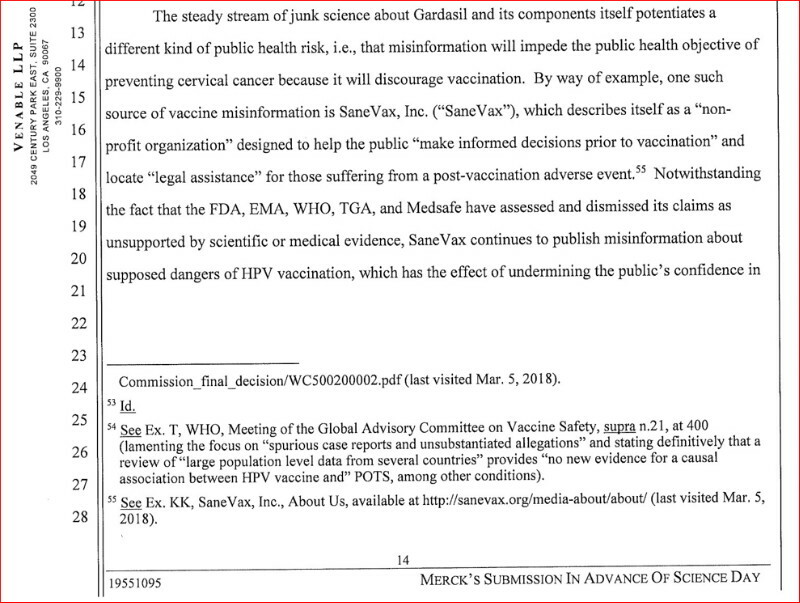 The complaint outlined the fact that the Plaintiff and her family believed that Merck had wrongfully and deceitfully failed to perform in the preapproval processing period and thereafter, the material scientific and medical investigations and studies relating to the safety, effectiveness and need for the Gardasil vaccine as required by and under the FDA directives and regulations. It is a well-known fact, that all pharmaceutical products must undergo extensive pre-marketing clinical trials often spanning several years before the FDA can consider the product for licensing. 9. Other items related and material to risk/benefit and quantitative risk assessments not now known and if required leave of Court will be requested to amend this complaint to set forth fully such item or items when ascertained. Not only did the family and their attorney outline an excellent and well thought out case, they went one step further and suggested that the court hold a Science Day Hearing. So, what did both sides offer in the way of science to support their case and did the Judge agree to his unusual request? In an unusual step the Judge in this case, agreed to hold a “Science Day Hearing” to enable the court to get a better understanding of the science behind the HPV vaccine. In advance of the scheduled science day presentation, both parties submitted briefs that outlined their side’s view of HPV vaccine science. In other words, for the first time ever, both sides including the vaccine’s manufacturer Merck, were given the unique opportunity to present to the court, their up-to-date science and studies proving the safety and effectiveness of this vaccine. The information provided would prove once and for all, whether or not Gardasil was not only a safe vaccination but necessary in the fight against cancers caused by the HPV virus. WHAT SCIENCE DID THE TWO SIDES PRESENT? The paperwork that was submitted clearly demonstrated many of the issues surrounding HPV vaccines and vaccination policies. The Plaintiff’s submission, offered clear precise facts to enable the Judge to understand the science behind the vaccination. “There are approximately 130 strains of the HPV virus, of which only 15 to 18 strains are known to be associated with cervical cancer. The Gardasil vaccine provides protection against only 4 specific strains, namely HPV 6, 11, 16 and 18. Strains 16 and 18 are thought to be casuallyassociated with 70 % of the worldwide HPV related cervical cancers. HPV 6 & 11 are associated with warts. They outlined a brief history of the immune system and how it works and continued by describing the nature of the autoimmune diseases that the injured teenager was now suffering from. To support their argument, they included a wide range of scientific studies that had been written by some of the world’s leading experts and they criticized Merck for ‘misleading the public’ in their advertising campaign. “Generally, with vaccines an adjuvant is required to be injected as a part of the vaccine to increase the body’s immune response to the antigen (disease causing organism). The most commonly used adjuvants for many years have been aluminum salts with an Aluminum hydroxide base. “The foregoing is merely illustrative of the complex and extensive scientific factors involved in this litigation. Although the purpose of Science Day is to provide the Court with information as to the nature and extent of the complex scientific matters involved, it is necessary to connect these matters to a foundation rooted in the facts of the case before the Court, which may be construed as argument. 1. Fast tracking of the FDA approval process to a 6-month period when criteria for fast tracking were not met. 2. Five-year effectiveness of qGardasil as of 1/1/2011, now believed to be 8 years. 3. Use of end points which did not establish the effectiveness ofqGardasil. 4. Effect on the clinical trial analysis of the removal of participants experiencing adverse and serious adverse events. 5. The effect of non – HPV 16 and 18 cancer producing strains on cervical cancer occurrence when HPV 16 and 18 are eliminated. 6. Lack of adequate pediatric clinical testing of the qGardasil regarding potential ovarian disorders/failures. This, in our opinion, failed to address the main points of the case that had been put forward by the Plaintiff and we found it extraordinary, that given this unique opportunity, Merck offered the Judge very little in the way of scientific evidence. In fact, throughout Merck’s submission, instead of presenting the court with evidence from the Phase 1,2,3 and 4, pre-licensing vaccination trials, that should have preceded the vaccination coming onto the market, Merck appeared to rely heavily on post-marketing evidence from the VAERS website, the CDC, the FDA and other similar organizations. Furthermore, instead of producing any real science as one would expect, Merck chose to use part of their unique opportunity, to discredit SaneVax Inc, an organization dedicated to providing the public with scientific facts and evidence behind vaccination safety. Another interesting point that we discovered on reading Merck’s scientific day submission, was that their submission contained a large amount of information that appeared to focus on proving that Gardasil did not cause the teenager’s condition, instead of concentrating on the task at hand. It will be interesting to see the final outcome of this case and we wish the family and their attorney, every success in their endeavour to get justice for this young lady’s injuries. To learn more about the underreported harms of HPV vaccine, view our database on the topic here. To learn about the unintended, adverse effects of vaccinations in general, view our database on the topic here.